Looking for immense load bearing strength with minimum of maintenance! Then a concrete weighbridge deck is the ideal choice. Our Concrete Decks enable throughputs of bulk materials and are designed to keep installation, maintenance and operation as simple as possible even in the saline and corrosive environment. Looking for immense load bearing strength with minimum of maintenance! 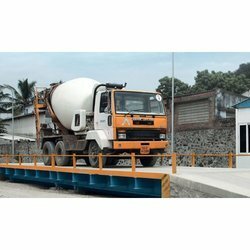 Then a concrete weighbridge deck is the ideal choice. Our concrete decks enable through-puts of bulk materials and are designed to keep installation, maintenance and operation as simple as possible even in the saline and corrosive environment. We can produce up to 150 Truck Scales per month. Essae Concrete Truck Scales are available in capacities ranging from 10 - 150 ton and platform sizes of 2m x 2m to 25m x 6m. You can choose either a Surface Mounted or a Pit Mounted Concrete Scale depending on the space availability. The Steel Frame for the concrete scale is designed to withstand harsh environmental conditions. system is carried out prior to delivery. New wireless tension link load cells gives you an accurate and reliable system that would cost twice as much from the competition. Simply connect our wireless tension link as illustrated , turn on wireless handheld readout and you are in business. It is just that simple ! Download saved data to your PC. 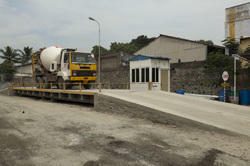 Looking for Concrete Weighbridge ?